I know I know. It’s strange that I would pick an anime character to live your life by. But let me explain why this is particularly important. 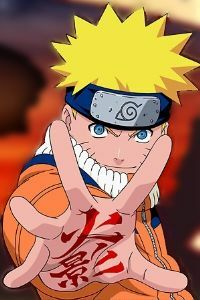 Naruto Uzumaki was a clumsy little guy in the Leaf village. People shunned him because within him was imprisoned the nine tailed fox demon, and thus he was turned into an outcast to society. But through pure will and determination, he strives to achieve his goals, even if it costs him his life. In fact, there were many-a-time that he probably would have died if not for pure will only to go on and move forward. This is why this little blonde haired kid from the leaf village is so important. He views himself as a failure, but he just trudges on like a little soldier, never knowing when to quit. He faces indescribable odds because they stand between himself and his dreams. And he trains until there is no more fight at all in him and he inspires his friends using himself as the low man on the totem pole and letting them know that if he can do it, anyone can. Naruto, if only we could all be like you. The men in my house (me and my sons) really like Naruto also. We even had Sand Ninja headbands (we thought about the getting Naruto jacket but that was too expensive). My oldest son does the strange thing of reading the latest manga by watching youtube videos of them. People used to say that video will kill reading, but this is an entirely different twist on the matter!